Aberfeldy & District Gaelic Choir raised over £2,000 at its “Summer Showtime” variety evening in a packed Aberfeldy Town Hall at the weekend (Saturday 9th August). Star performances from Choir conductor Isobel Rutter, and acclaimed singer and folklorist Margaret Bennett were very well received by the audience, many of whom expressed to choir members that they hoped it would become an annual event. Another very popular highlight was David (“Dibble”) Morton, a valued bass in the choir who made his stage debut playing the guitar and singing “Among the Birks” (Gallagher & Lyle) and “Talking to My Father” (Dougie MacLean). He was accompanied on the guitar by Californian folksinger (and choir alto) Linda Dewar, who also sang two American country songs. 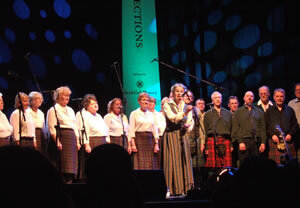 Aberfeldy & District Gaelic Choir members joined Margaret Bennett on stage and accompanied her, closing the programme with some Gaelic songs. The evening was compered with typical wit and panache by local singer-songwriter Alan Brown. The Choir will be donating a portion of the money raised to a local cancer charity.